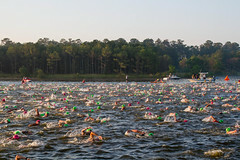 Ironman Texas has their registration open today. If you are new to the sport, this one will sell out quickly so sign up today at noon if you want to race. I did this race in the first year it took place and was blown away on how great the organization was. The course is not too bad, the weather is the challenge here. It can be very hot. It is one of my favorites and I will go back in the coming years. Sign up!